I Skate, Therefore I Am: Is 420 still illegal? In November, California rejected the opportunity to decide whether possession of marijuana was a legal activity even though there are a lot of arguments in favor of overturning the ban, including the following which were listed in the Secretary of State Voter . o Marijuana prohibition has created vicious drug cartels across our border. In 2008 alone, cartels murdered 6,290 civilians in Mexico; more than all U.S. troops killed in Iraq and Afghanistan combined. In Mexico, more than 37,000 people have been killed since President Calderon declared war on the drug cartels, which make about half their profits in the marijuana business. It is not marijuana itself that causes violence on U.S. streets or the bloody war in Mexico -- it is the policy of marijuana prohibition. o 60% of drug cartel revenue comes from the illegal U.S. marijuana market. By controlling marijuana, Proposition 19 would have helped cut off funding to the cartels. - Police waste millions of taxpayer dollars targeting non-violent marijuana consumers, while thousands of violent crimes go unresolved. - California faces historic deficits, which, if state government doesn’t balance the budget, could lead to higher taxes and fees for the public, and more cuts to vital services. Meanwhile, there is $14 billion in marijuana transactions every year in California, but we see none of the revenue that would come from taxing it. - Proposition 19 could cost our K–12 schools as much as $9.4 billion in lost federal funding. - Employers who permit employees to sell cosmetics or school candy bars to co-workers in the office, may now also be required to allow any employee with a “license” to sell marijuana in the office. While only 47% of Americans have smoked pot, a lot of skateboarders use marijuana for relaxation, but exact statistics have not been published. Demographic trends show that the movement to embrace legalization will likely continue: all polls reveal younger respondents as the most likely supporters. 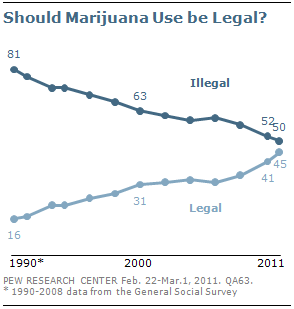 In the Pew poll (the graphic on the left), the majority of 18-29 year olds (54% favor VS 42% who oppose) and a slim plurality of 30-49 year olds (49% support VS 47% who oppose) said marijuana use should be legal. Skateboarding or walking on thin ice, what's more difficult? Bob Burnquist at Maloof. In the new CNN poll, about as many respondents under 50 said they supported legalizing marijuana (49 percent) as opposed it (50 percent). Most pro athletes flee from anything that smell of controversy, but not skateboarders. Especially Bob Burnquist, and Jen O'Brien. 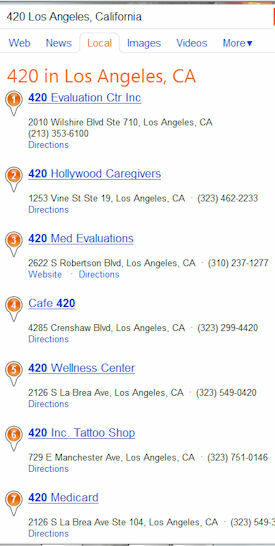 They are two of the most outspoken fervent supporters legalization. Together with Jen O'Brien, Bob's girlfriend and one of skateboarding's top riders, they live near San Diego with their young daughter, Lotus, in a home with a skateboard park and an organic vegetable garden in the yard. They both feel compelled to stand up for marijuana. Legalize it, they say - marijuana can be used for fuel, for medicine, even for food. "There is so much we can do with it," Burnquist says. Jen O'Brien even appeared on the cover of High Times magazine a couple of years ago, holding a big, fat bud. "I believe it's God's gift to us," says O'Brien, but she won't say if she actually smokes. A couple of days before the lost California election, she posted on her Facebbok page a picture of a ballot with the Yes on Prop 19 checked. Burnquist says he's an occasional toker and he supported O’Brien’s decision to pose for High Times, but he says he isn't entirely comfortable with his own position on pot. He knows he's a role model for a lot of kids. He knows pot advocates have been targeted by cops. ﻿ Bob Burnquist is also a committed environmentalist and a vegetarian. He refuses to endorse junk food, even though companies have offered big-money deals. Marijuana, he says, is an environmentally sound source of many products, and its benefits to society outweigh the risks to his career. "I feel like I have to fight for what I believe in," he says. A couple of years ago, he founded the Action Sports Environmental Coalition (ASEC) supported by action-sports athletes, industry leaders and natural-products companies aiming to answer the question: “What would happen if the action sports industry became a role model for sustainability?” (Fitness Follows Sustainability?). ASEC founders Frank Scura, Bob Burnquist, Jen O’Brien and Damon Way answered the call in 2001 by creating the organization. ASEC specializes in progressive eco-education and empowers people to adopt a sustainable existence in a way that embraces their current lifestyle and enhances it. One reason skateboarders are more comfortable with pot than regular athletes is that they emerged from the punk rock scene of the 1980s, driven by counterculture kids who wanted nothing to do with regimented drills and authoritarian coaches. Drug laws didn't matter to kids used to jumping fences to skateboard in empty swimming pools. Today is 4/20 and at 4:20, you know what you have to do.